It is in our nature to yearn for more when we find something to which we feel drawn. Who is Swami Ashutosh Muni? The answers only begin to unfold in His presence - at first perhaps felt, more than understood. 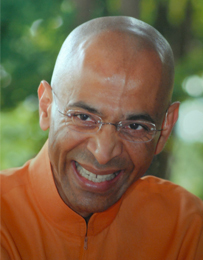 Swami Ashutosh Muni was born in Gujarat, India in 1953. He met his Guru at birth because his mother was a disciple of Swami Kripalvanandji. At the age of 7 he was sent to military school away from his family and returned home for only one month each year. However, during those visits he was privileged to be able to visit Swami Kripalvanandji in his mother's company. With the completion of his military schooling he was prepared to become a pilot. In 1970, at the insistence of his family and the urging of his Guru, he gained admission to medical school in Vadodara and visited Swami Kripalvanandji in Kayavarohan every weekend for his entire 7 years of medical training. For entire seven years every weekend he studied with Swami Kripalvanandji, learning directly from him; never missing an opportunity to be near his Guru. At Swami Kripalvanandji's request, Swami Ashutosh Muni, lived in India for 2 years in Swami Kripalvanandji's ashram between 1977 and 1979 . During this time in Malav, he trained MOST of the yoga teachers you see today in Gujarat, India. He had worked hard to create Swami Kripalvanandji's dream of yoga institute. In May of 1979 Swami Kripalvanandji called Swami Ashustosh Muni to US to prepare him for final Vows of Sanyasa and become a fine seeker. For 15 consecutive months he taught Ashutosh Muni everything that a master passes on to the only disciple and the lineage holder that is needed. In 1980 at the last Gurupurnima event in Summneytown, Pennsylvania, USA, Swami Kripalvanandji declared, "Now, no one is my disciple," thus forsaking everybody. In the following year, January 14, 1981 Swami Kripalvanandji initiated Swami Ashutosh Muni enabling him as Swami Kripalvanandji's ONLY disciple and a renunciate of the highest order. In short, Swami Kripalvanandji nominated him as the only lineage holder and forsake all the ashrams in India and passed the legacy to Swami Ashutosh Muni. Swami Kripalvanandji left US in the last week of September, 1981. He passed away in December of 1981. At the time of Swami Kripalvanandji's passing, He created two entities. Kripalu Samadhi Mandir and Kripalu Muni Mandal on paper. He told Swami Ashutosh Muni to bring these two entities to fruition as Swami Kripalvanandji's sole legacy. Swami Kripalvanandji said "THESE ARE MY FINAL WISHES AND I AM PASSING EVERYTHING (spiritual wealth, aswell as physical) TO YOU AS MY ONLY DISCIPLE. THIS WILL BE MY ONLY AND TRUE ASHRAM. Swami Ashutosh Muni's life began to take a different shape. In seclusion and silence, he immersed himself in sadhana (spiritual practices) for over 25 years between the two locations of Malav India and in the United States. In December of 2005 He came out of seclusion and has begun to teach around the world, touching hearts, transforming lives, and awakening souls. Swami Ashutosh Muni has created magnificent Mahasamadhi temple in Malav (Panchmahal District), Gujarat, India in reverence and loving memory of His beloved Master and Guru Swami Kripalvanandji as Swami Ashutosh Muni was instructed to create this entity. He has never asked for any donations nor accepted any donations from any person whatsoever. Demonstrating his genuine love for humanity, he has built a free English education school in Malav from the ground up, which provides the highest quality education for grades K-12, the renovation of a hospital that offers quality healthcare to the village of Malav and some 50,000 people from the surrounding area. His teaching style weaves threads of humor, directness, compassion, patience, devotion and truth. He is remarkably in tune with our contemporary culture and what he speaks about is always for the benefit of all. The integrity with which he teaches, the depth of wisdom that he shares, and the love that he radiates need only be experienced to know he is a rare being. He is the living example of the pure teachings of our yoga lineage. He embodies the highest principles of respect and love for truth, seeker, family and community, and for God.